If you’re a developer using Google’s Cloud Platform, the company is introducing a new tool you’ll likely find handy. You can now view a Web dashboard to check status updated on Cloud Platform services. Current service status is shown with a column of green indicators on the right side of the dashboard’s graph. Whenever a service disruption occurs, a red bar appears and persists until the issue is fixed. If you want more specific details on an incident, you can just click on it to see a description including a summary of the problem, its impact, causes and prevention. You can also sign up to a service status RSS feed by clicking on the link at the bottom of the dashboard page. 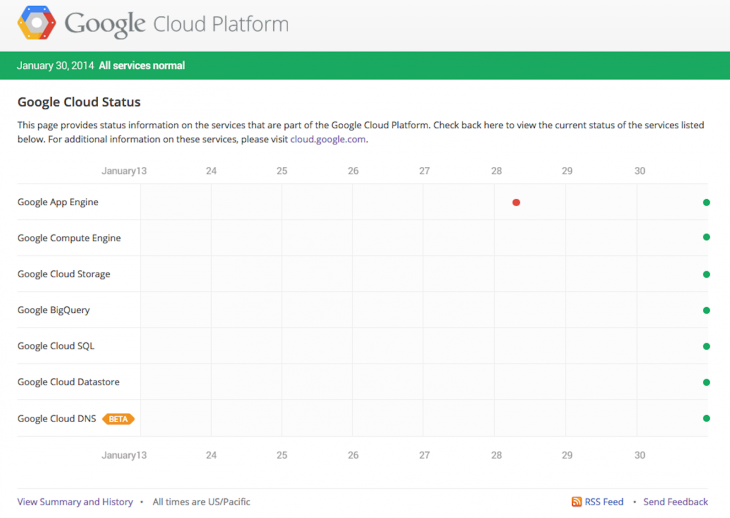 Developers already using Google’s Cloud Monitoring events log will also see this information integrated.